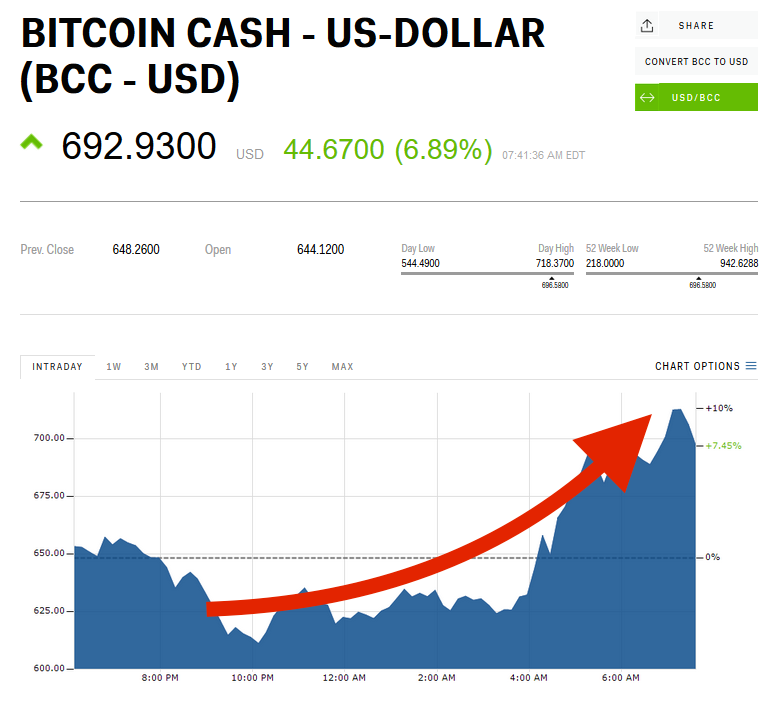 Bitcoin cash"s rise continues Thursday, pushing the price of the upstart cryptocurrency above $700. Bitcoin cash soared to $718 per coin Thursday- morning, up around 8%. The cryptocurrency has- since pulled back and is now trading around $695. On Wednesday, bitcoin cash led a huge cryptocurrency rally, which followed a market crash earlier in the week. The crash, which was triggered by a crackdown on the cryptocurrency market by major financial regulators, sent digital coins into a tailspin that erased- over 20% of their market caps. The price of bitcoin cash, the clone coin of bitcoin, has fluctuated since it split from the original bitcoin on August 1. A day after it came on the scene, it rallied above $700 per coin, only to drop to $200 by August 6. Volatility in a cryptocurrency"s early days is not an unusual thing. Since the end of August, however, the price has been relatively stable around $550 per coin, save Monday"s crash. Bitcoin cash"s retest of its record high- may be an indicator that it has the wherewithal to continue to rival bitcoin. Currently, it is 3.7% more profitable to mine bitcoin cash than bitcoin. And more industry folks are throwing their support behind the coin. On Wednesday, Bitcoin.com, the bitcoin wallet company, for instance, announced it would add bitcoin cash functionality for all of its wallets. Still, bitcoin is no slouch. It"s up 657% over the past year, at $4,627 per coin.